Natural stone is an excellent choice as an accent on swimming pools, to create beautiful waterfalls, or amazing patios, walkways, and pool decks. Homeowner’s often choose stone for its natural beauty, color, and variety of textures. Whether you choose flagstone, travertine, or slate to use in your project, you need to seal the stone after installation. Stone is naturally porous which means it will absorb water, dirt, and oils. Whether the water comes from rain or an irrigation system, it has calcium in it, which after time, will deposit into the stone leaving white lines or creating a dull, foggy appearance on the stone. Saltwater pools are extremely popular these days and are a wonderful choice for many reasons. However, saltwater will eventually cause all stone, particularly flagstone and slate, to discolor, flake and disintegrate. If you are a saltwater pool owner, with flagstone coping, you have most likely already noticed the sand in the bottom of your pool. The salt from the pool water deposits into the flagstone and slowly breaks apart the layers causing accelerated spalling or flaking. Saltwater also has similar effects on moss rock, which is used primarily to construct waterfalls and walls in and around swimming pools and hardscapes. 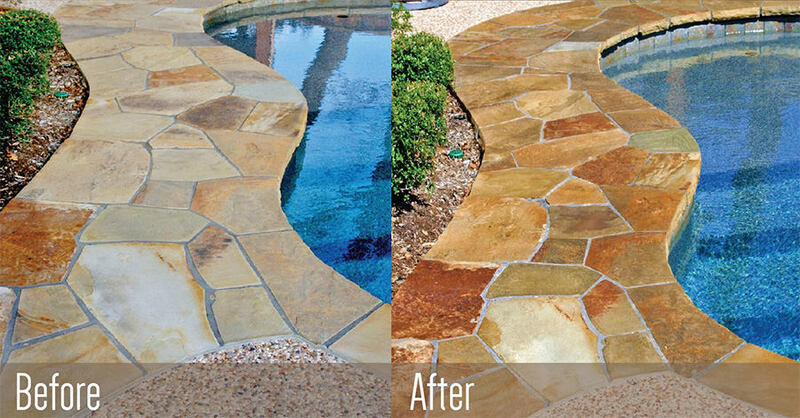 When sealant is applied to the natural stone it is protected from absorbing water, calcium, or salt deposits. Stone Armor penetrates deeply into the substrate; it consolidates and strengthens the stone. It prevents saltwater erosion and retards efflorescence of porous materials. Stone Armor sealant doesn’t change the look of your stone or simply “sit on top” of the stone, it becomes part of the stone, absorbing deep into it, preventing salt water spalling and porous rock erosion. After our application of Stone Armor, you can pour water on the surface and see how it puddles on top of the stone creating an impervious surface. If you have an outdoor kitchen or grill area with natural stone you know how hard it is to avoid grease spills or drippings from the grill and how other messes can damage or permanently stain unprotected stone. Stone Armor sealant will help your natural stone resist many stains and makes clean up and removal easier than unprotected stone. Your backyard is your own personal paradise. You painstakingly designed the outdoor space, choosing the quality stones and finishes to create the perfect outdoor entertaining area. Call Aqua Pearl Pools to protect your investment.